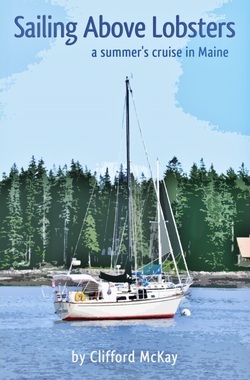 Cruise for the summer on a 32' sloop. Navigate in fog, thick persistent fog. Dodge the lobster trap floats. Sail alongside Windjammers. View Maine from a new perspective, from water level. Visit old friends who said, "You must come see us in Maine." Meet new friends who welcome you, dripping wet, and treat you royally. Race on a Friendship Sloop, the classic work boat of Maine. Cruise for three days with the Ocean Cruising Club and chat about distant ports. Attend the Island Institute lectures and learn how complicated it is to distinguish those "from here" and those "from away." Discover the quiet, determined, straightforward, Maine character. Anchor in isolated coves with only starlight above as the fragrance of balsam fills the air. Feast for the summer on lobster, wild Maine blueberries and blueberry ice cream. It will be hard to leave. Both Clifford and Bezy are commodores in the Seven Seas Cruising Association. He is also a member of the Ocean Cruising Club. His articles on sailing have been published in Southwinds Magazine (Jan, 2010 - May 2012) , and his supplement on the Origin Of The Optimist Pram is included in "History of the Optimist Dinghy 1947 - 2007" by Robert Wilkes. Cliff has a BA from Emory University, a MDiv from Union Theological Seminary, Richmond, VA, and a MA and PhD from Vanderbilt University. He published a theological work for his PhD. I sailed in early Southern Ocean Racing Circuit competition, Midget Ocean Racing competition, the Junior Snipe Nationals and crewed on a racing yacht, returning it from Maui to Seattle.